We celebrated in style last night...with some hot chocolate, Christmas cake and cookies! Brisbane weather very kindly decided to be summery yesterday and ﻿we enjoyed a rare day of sunshine and dry clear skies. So last night we joined a few hundred people and ventured up the mountain behind our house to get a glimpse of the early firework display in the city. 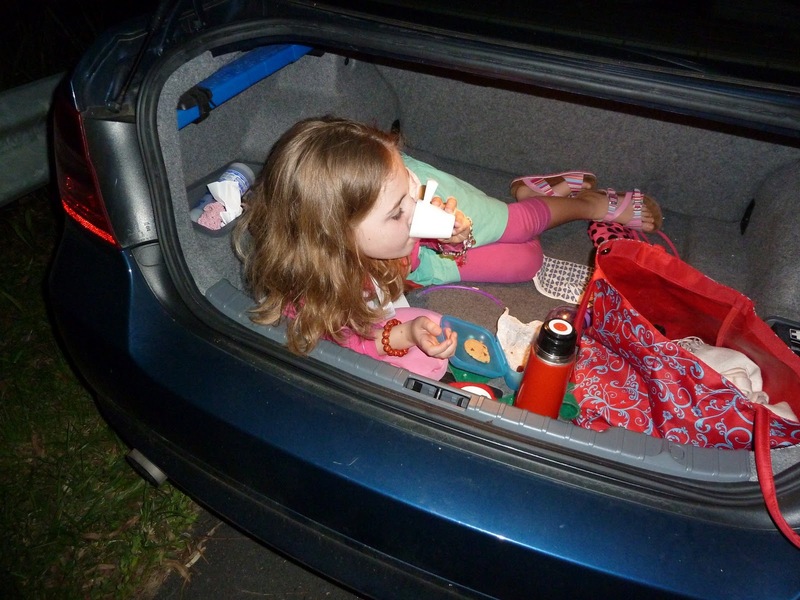 The first 'family friendly' fireworks are at 8.30pm so the children get to 'stay up late' and welcome in the new year. 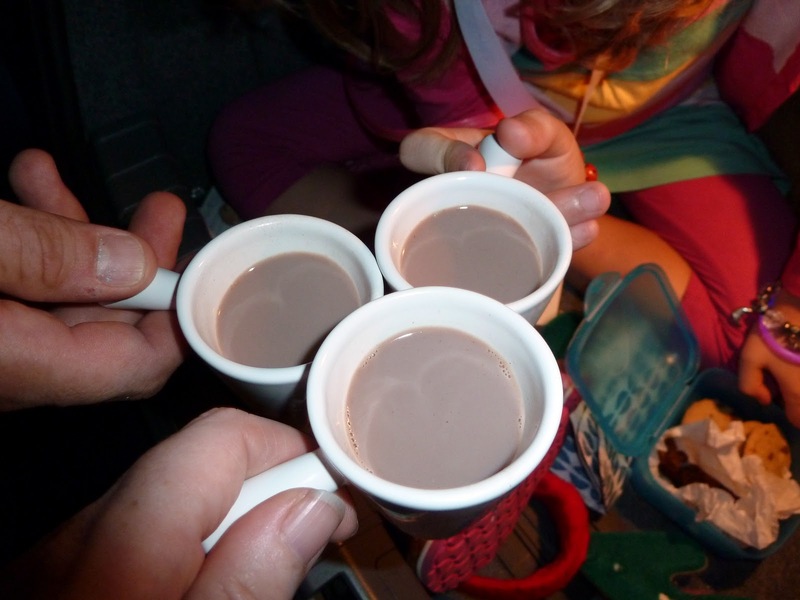 We watched the display and then toasted the new year with a thermos of hot chocolate with melted marshmallows. I swear I have never tasted such good hot chocolate - it even rivaled our trip to the Lindt cafe in Sydney! Sibs got a bit spooked by the rustling in the grass and the bushes and was imagining all sorts of creepy creatures, so she hopped in to the boot of the car to enjoy her drink. Talking of creepy creatures, let me share these beauties. I have seen a Blue Tongue lizard on our driveway a few times during the last few months, but I never have the camera with me. A couple of days ago I happened to have the camera in my hand when Sibs shouted that she had seen a snake! On closer inspection the snake had legs...and became a lizard. 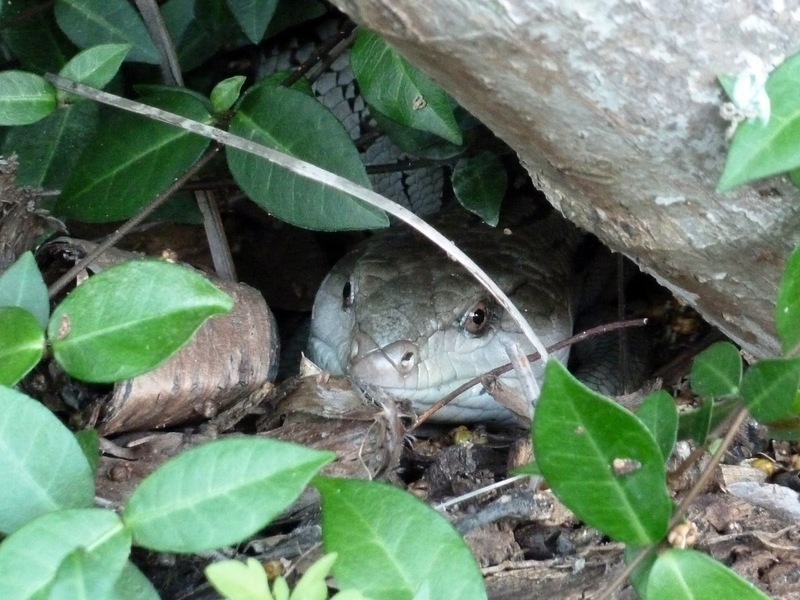 Unfortunately I didn't capture the blue forked tongue, but here he/she is trying to hide from the lens. 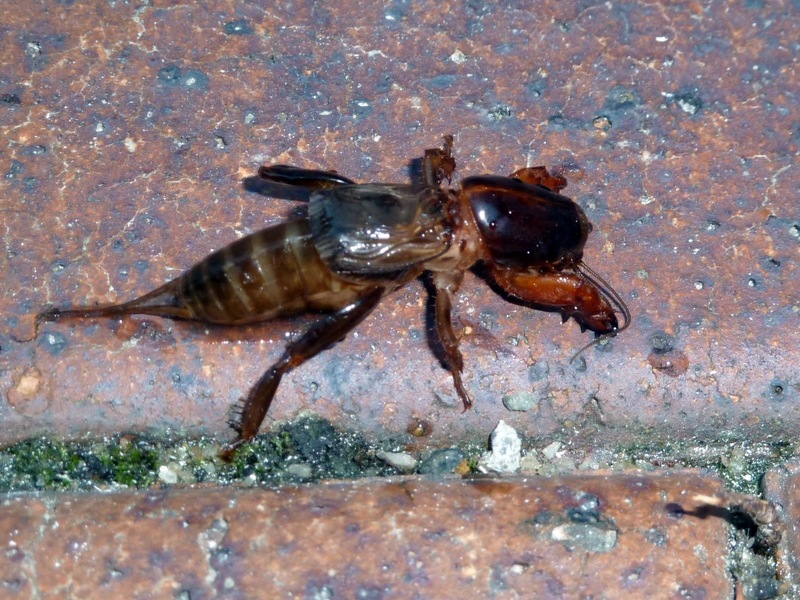 Our other creepy creature that we came across this week was a mole cricket. 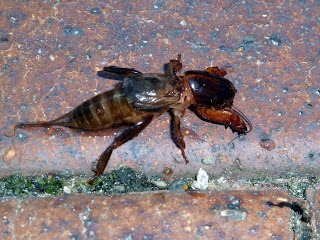 This is a bit like a cockroach except uglier! It had decided to have a bit of a splash in the pool and was rescued by brave husband. Rescued, meaning thrown out very quickly! Guess what? 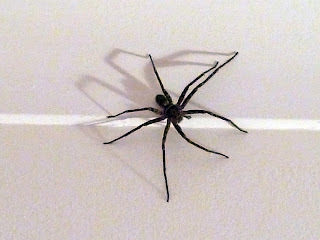 The huntsman just won't leave!! The other night in those precious moments when everyone is in bed, the whole house is quiet and I get my five minutes of catching up on the news events of the day I spotted it. It was stealthily venturing from one side of the room to the other - yuck. 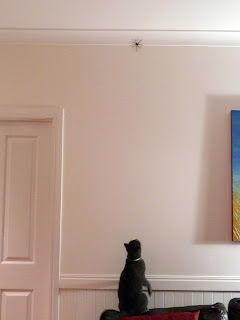 The cat actually saw it first and tried to protect me of course! She excitedly jumped on the back of the sofa and warned it away...but this huntsman has no fear! not the best shot, but check out the size?! ﻿﻿﻿When I pointed the camera at it (from a reasonable distance) I pressed the button and the red eye flash activated and I got to see its two big eyes. I nearly dropped my camera!! If it's not the same one I want my money back from the pest control man! Thanks so much for commenting on my blog. Our holiday was fantastic and we did indeed have many awesome adventures. I'll add your blog to my roll now. Happy New Year to you! Thank you so much for such a nice article, I would like you to visit our site, and request your advice/opinion. It will be our pleasure to serve you and solve your purpose, you are always welcome to contact us. Why visit this site for your Melbourne window cleaning needs? We are Melbourne window cleaners with 20 years experience. We combine the professional service that you come to expect with the old fashioned courtesy that is so often missing today.